As with all things in the smartphone space a new smartphone eventually gets compared to the top dog in the mobile arena, the iPhone, and the same goes in the tablet space as well, sooner or later if a new tablet hit the market it will be compared to the Apple iPad 2, and this has now happed with the new slate from HP, the HP TouchPad. 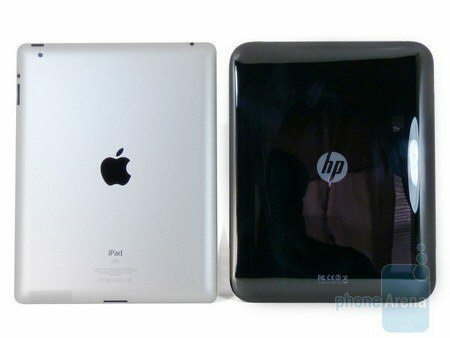 So what we have for your viewing consideration below is a video comparison battle between iOS and webOS where the might of the Apple iPad 2 takes on the newness of the HP TouchPad. The HP TouchPad versus the Apple iPad 2 video comes our way courtesy of the guys over at Phone Arena and delivers just over thirteen minutes of tablet fighting. In the in-depth video comparison the guys compare features of both tablet devices to try and find out which slate will be the better option for you, and start off this comparison with the design of the tablets, which they say the Apple iPad 2 is definitely better due to craftsmanship and choice of materials and feels like a premium slate whereas the HP TouchPad is basically plastic and a fingerprint magnet. The webOS 3.0 tablet is also somewhat heavier than the Apple iPad 2 even though the TouchPad is manufactured in plastic, but overall the Apple iPad 2 wins in the design stakes due to its razor thin profile, being streamlined and a solid tablet all round. Both the HP TouchPad and the iPad 2 feature a 9.7-inch display with 4:3 aspect ratio and also sports the same resolution, while colour production is “very natural” with both slates. Both tablets feature a front facing camera with the HP TouchPad offering a 1.3 megapixel camera for video chat, while the Apple iPad 2’s 0.3 megapixel camera can do both video chat and shoot self portraits. The guys have also done an in-depth written comparison between the HP TouchPad and Apple iPad 2, which can be read by hitting up their website, but if you don’t have time for that then you can just head on down and hit the play button to check out the video footage to see whether the HP TouchPad can best the Apple iPad 2 or not, because you know I’m not going to reveal the outcome, but then I figure you probably already know that anyway…enjoy the tablet comparison fight.